Azusa, Calif. - The Youngstown State men's tennis team picked up a 4-3 win over nationally-ranked Division II foe Azusa Pacific on Saturday at the B&M Tennis Complex. The Cougars are ranked 13th in Division II and suffered their first loss of the year. YSU (10-5) has won five straight dual matches, the last three of which have come in away matches. APU falls to 8-1 on the season. The Penguins won all three doubles matches to claim the doubles point and split the six singles contests to take the 4-3 decision. At No. 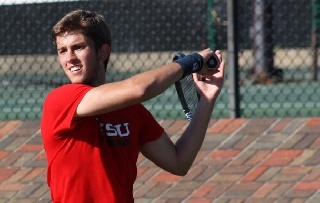 2 doubles, YSU won 6-4 before claiming hard-fought 7-6 wins at No. 1 and No. 3 doubles. In singles play, Danlyo Veremeichuk, Gabriel Tolesani and Thomas Rodrigues earned victories. At No. 3, Rodrigues beat Pascal Engel 6-2, 6-3. At No. 4, Veremeichuk picked up a come-from-behind 3-6, 6-3, 6-0 victory over Shepherd Newcomb. At No. 6, Tolesani also fought back after dropping his first set. Against Roberto Luconi, Tolesani picked up a 2-6, 6-3, 6-4 victory. The Guins have a busy Sunday with matches set against Villanova and UC Riverside.